Getting close to start up time. I have available Castrol GTX 10-40 semi and Castrol Actevo pre-mix 2T oil. Are these suitable for my bike? Some people say I'm a complete fool. Ah! But some parts are missing. I only use 80/90 wt gear oil in the cases, but the injection oil should be fine. Many synthetic and semi-synthetics cause clutch slip. Oil is a much discussed topic on all bike forums.... Its a personal choice really. There are a few NoNo's. As pointed out fully synthetic can cause wet clutches to slip. A lot of guys use ordinary 10\40 mineral oil just change it often. With regards to 2T oil dont mix mineral and synthetic oil as it causes 'Glooping' something similar to clotting which will prevent flow. Good luck with the startup! Do semi-synthetic motor oils also cause clutch slip? I have just bought some Putolene V twin 20W40 oil for my GT380 because it is the right viscosity. Will semi-synthetic cause me problems? Full synth will definitely cause clutch slip when 'spanking'. Semi synth 'might' cause clutch slip - I use ordinary 20w50 in the 550 and 750 gearboxes and change it every couple of thousand miles. I use semi synth Putoline TT light in all the triples and they run fine. Like the others suggest, don't mix different types of 2T oil, and I would either run the 2T tank low then fill it with whatever you prefer, or empty it if it's been in there a long time or you're not sure what's in, then refill with new and run for the first 20 miles with the pump wedged fully open to get it through as quick as poss. Do it in one run, then let the pump work as normal while doing a bit of 6000rpm+ work to clear it out. this bloke asked me one day about his t250 and gt250a. apparently the double cog that drives the oil pump and kickstart mech etc was kaput, either worn out or broken or both [forget now] and this was the second time in weeks. i asked him what oil he used in the gearbox and he replied hypoid 90 gear oil. there's your problem - NEVER use 80/90 weight oil in these gearboxes, as normal common or garden supermarket 20/50 is quite good enough. after rebuilding both bikes for him - with second hand double cogs from my spares and 1200/1300 cc's of asda price 20/50, he had them back. he rides them regularly, summer and winter, he aint slow either, the double cogs have never given him problems since and he changes the 20/50 about every 2 years. i rebuilt them over 10 years ago. you don't need super-duper fully synth magnetic golden oil with liquid tungsten [sorry] costing about $50 a litre. use ordinary 20/50, basic, cheap walmart at $5 a gallon. and don't forget on a t250 that oil has got to lubricate the middle main bearing through a very narrow oilway, and ditto the right main bearing on the 250a. don't use thick gearbox oil! i asked him what oil he used in the gearbox and he replied hypoid 90 gear oil. there's your problem - NEVER use 80/90 weight oil in these gearboxes, as normal common or garden supermarket 20/50 is quite good enough. ........ don't use thick gearbox oil! This is turning into a great oil thread! You can't compare motor oil and gear oil viscosity directly. They are measured on different scales. 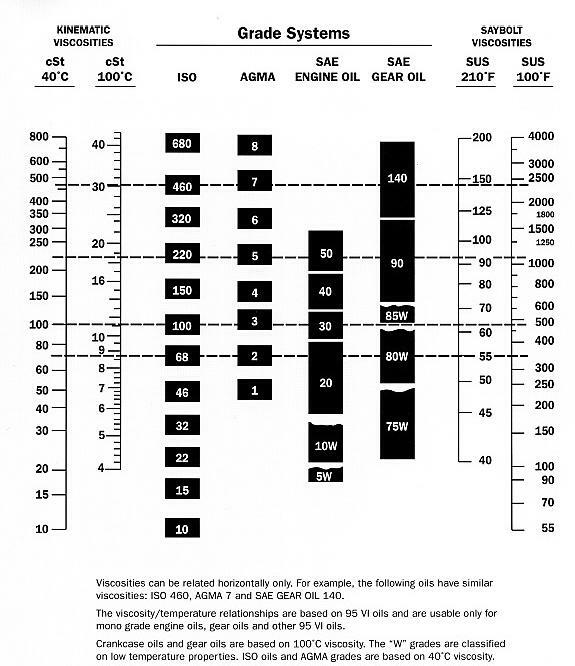 80/90 gear oil is nearly the same viscosity as 20/50 motor oil. But there is much more to oil than viscosity. Oil has changed much since Suzuki printed the service manuals nearly 50 years ago. Modern oils not only contain "oil", but many synthetic modifiers. Motor oils contain multiple detergents, modifiers to be extra slippery (so when the oil breaks down, it then is just slippery), and more. Great for 4-stroke motors, where dirty exhaust gasses mix with (and degrade) the oil. Our 2-stroke gear boxes are different. There is virtually zero contamination by exhaust gasses. The oil just cools/lubricates gears, bearings, and clutches. Much more like a car transaxle, rather than a car engine. GL-4 gear oil is specifically designed for this application. It lubricates the gears and bearings, without the slippery modifiers which you really don't want in a wet clutch system.